Our basic Inkless Wipe Kit, it contains 1 Inkless Wipe, 2 sheets of the special paper (these will not work on ordinary paper & need specially treated paper) and full instructions. 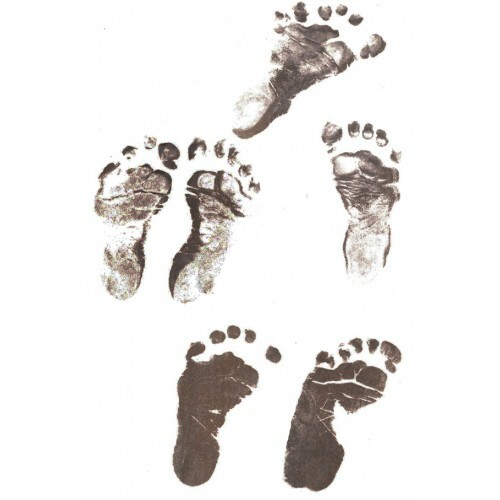 This is the basis for many further options and is perfect to slip into your hospital bag so that you can capture your baby's footprints as soon as they are born, the 'ink' is invisible, so there is no mess! These wipes are used in USA hospitals for identification of newborn babies when they are born, so they are well tested and are intended for this use. Inkless wipe prints are much more detailed than paint wipe prints, they show up all the tiny lines in the hand and footprints making them perfect to use to create a variety of keepsake items, we sell a variety of items that can be created from these original prints, including jewellery and prints, if unsure then please ask. Our kit includes 2 large A4 sheets, but you can easily cut these down to 4 smaller sheets if you prefer to. I suggest that because the wipe will dry out fairly quickly after you open it (although they do feel dry even when freshly opened, this is normal and how they are meant to be) that you wipe the wipe over the hand or foot and then press onto the paper, twice before wiping it again and repeating, I would suggest that you cover the paper in prints and then you can scan them afterwards and sort them out then. This kit can also be used for pets.